Nothing beats a real pine tree in your home for the holidays. However, because pine trees are natural, they will bring in a lot of pine needles, debris and the messy, nearly impossible to remove tree sap. Removing sap from your tree stand cannot be done with only soap and water, but by using a few other supplies already in your cabinets. You can remove the sap and store your tree stand so it is ready for next year. Soak a cotton ball in nail polish remover or rubbing alcohol. Squeeze the cotton ball – over a sink or container – to remove excess solvent. Rub the saturated cotton ball onto the plastic or metal tree stand in a circular motion. Do this until you remove the sap, using multiple cotton balls if needed. Once a cotton ball is dirtied, use a new one. Mix three parts baking soda to one part water and, using a paper towel, wipe across the entirety of the tree stand to remove any remaining residue. Wash and dry the tree stand as you normally would to remove any debris from the cleaning solutions. Store in a clean, dry area until next year. Always clean your tree stand as soon as you notice the tree sap. The longer the sap sits, the harder it is to remove. Wear protective gloves to prevent getting sap on your hands. If you do get sap on your skin, then use hand sanitizer to remove it. 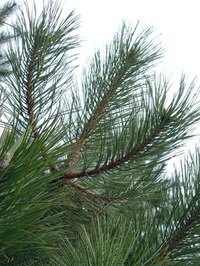 What Is the Sticky Stuff in Pine Needles?